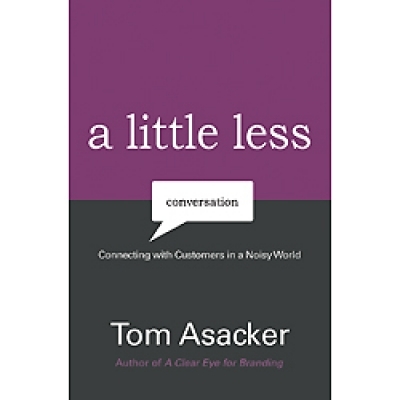 "A Little Less Conversation by Tom Asacker"
It’s a noisy world out there—one where consumers have learned to tune out advertising messages, whether they are online or offline. Following on the success of his book, A Clear Eye for Branding, brand guru, Tom Asacker, says it is time to cut back on the conversation and focus on bringing value to the customer. And value, for Asacker, is less about price and more about how the customer feels about a product or purchase. In Asacker’s view, the endgame for a company is to provide customers with a happy experience, and to enhance their sense of worth and belonging. That takes a certain amount of collaboration and dialog with customers, talking with them not at them. 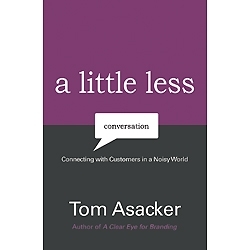 In his latest book, A Little Less Conversation: Connecting with Customers in a Noisy World, Asacker explains precisely how today’s successful brands are different from others and how they have found ways to connect with the customers’ mindset. He explains why customers have tuned out the irrelevant chatter of dispassionate messaging and uninspired employees and how organizations can change to focus on the customers, not their products or services. Asacker's conversational and witty writing style is easy to share with colleagues to get the conversation going about the new paradigm for branding.